Seven Deadliest USB Attacks provides a comprehensive view of the most serious types of Universal Serial Bus (USB) attacks. While the book focuses on Windows systems, Mac, Linux, and UNIX systems are equally susceptible to similar attacks. If you need to keep up with the latest hacks, attacks, and exploits effecting USB technology, then this book is for you. This book pinpoints the most dangerous hacks and exploits specific to USB, laying out the anatomy of these attacks including how to make your system more secure. You will discover the best ways to defend against these vicious hacks with step-by-step instruction and learn techniques to make your computer and network impenetrable. The attacks outlined in this book are intended for individuals with moderate Microsoft Windows proficiency. The book provides the tools, tricks, and detailed instructions necessary to reconstruct and mitigate these activities while peering into the risks and future aspects surrounding the respective technologies. 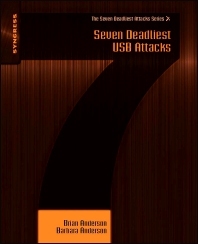 There are seven chapters that cover the following: USB Hacksaw; the USB Switchblade; viruses and malicious codes; USB-based heap overflow; the evolution of forensics in computer security; pod slurping; and the human element of security, including the risks, rewards, and controversy surrounding social-engineering engagements. This book was written to target a vast audience including students, technical staff, business leaders, or anyone seeking to understand fully the removable-media risk for Windows systems. It will be a valuable resource for information security professionals of all levels, as well as web application developers and recreational hackers. Computer Online Forensic Evidence Extractor or Detect and Eliminate Computer-Assisted Forensics? Brian Anderson started his security career as a USMC Military Police officer. During his tour in the USMC Brian also served as an instructor for weapons marksmanship, urban combat, building entry techniques and less than lethal munitions. He also took part in the Somalia humanitarian efforts and several training engagements in the Middle East. Brian’s technical experience began when he joined EDS where he became part of a leveraged team and specialized in infrastructure problem resolution, disaster recovery and design and security. His career progression was swift carrying him through security engineering and into architecture where he earned a lead role. Brian was a key participant in many high level security projects driven by HIPAA, PCI, SOX, FIPS and other regulatory compliance which included infrastructure dependent services, multi-tenant directories, IdM, RBAC, SSO, WLAN, full disk and removable media encryption, leveraged perimeter design and strategy. He has earned multiple certifications for client, server and network technologies. Brian has written numerous viewpoint and whitepapers for current and emerging technologies and is a sought out expert on matters of security, privacy and penetration testing. Brian is an avid security researcher with expertise in reverse engineering focusing on vulnerabilities and exploits and advising clients on proper remediation. An avid security researcher with expertise in reverse engineering focusing on vulnerabilities and exploits and advising clients on proper remediation. Barbara Anderson has worked in the information technology industry as a network and server security professional for over eleven years. During that time, she has been acting as a senior network security engineer who provides consulting and support for all aspects of network and security design. Barbara comes from a strong network security background and has extensive experience in enterprise design, implementation and life-cycle management. Barbara proudly served her country for over four years in the United States Air force and has enjoyed successful positions at EDS, SMU, Fujitsu, ACS and Fishnet Security. These experiences and interactions have allowed her to become an expert in enterprise security, product deployment and training.